Home » FAQ » Can I rework 2 cavity mold to 4 cavity mold? Before going down that path, I would determine the actual costs of adding additional 2 cavities instead of making a new injection mold. Not just the costs of physically adding the new cavity, which is obviously cheaper than a new mold, but man-hours in design, troubleshooting the new layout in processing (which is much more likely to have problems than a new injection mold which has been designed from the start to accommodate the extra cavities), cooling, venting as well as downtime of the currently running mold when you add the additional two cavities. Additionally, you're taking a risk. Not just that you may not get the extra cavity to work properly, but that the two cavities that are already working won't fill properly anymore either. Depending on how old the current mold is, uneven wear may become an issue as well. You could end up wasting all that time and money you're dumping into it only to discover that you need to make a new injection mold anyways. 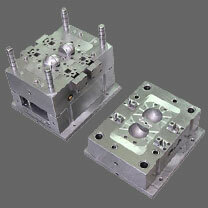 To decide an injection mold for unpredictable demand, I would see whether more cavities will change the mold base size. If part size is small and volume is low, a 2 cavities and 4 cavities mold may use the same mold base (hence use the same machine tonnage), then it may be wise to have a 4 cavity-capable mold with only 2 cavity cut, like a bridge mold. However, I am still a little bit doubtful on the saving we can gain by just not cutting the remaining cavity. Building a small injection mold is still the 1st preference. Then we may end up with 2 small molds, which is more expensive. However, the second mold is a duplicate mold which will not need to design, program, and go through various mold modification as the first mold. Furthermore 2 small injection molds are sometime more flexible for production planning compared to one big mold. We don't know the specific situation, but if it is about adding extra 2 cavities, you obviously have more demand than you expected, so I would recommend just making a new injection mold. Then you'll have the 2 cavity mold for backup if something happens with the new 4 cavity mold.